Joyleaf is a Wolfrider who embodies a perfect balance between the traditional Now of Wolf Thought and an ability to look beyond the here and now to foresee the consequences of one’s actions. Like her close friend and staunch supporter Clearbrook, Joyleaf’s wise council serves her tribe well. She Recognized her longtime lovemate Chief Bearclaw and the two are devoted lifemates. Joyleaf’s natural caution, quiet persuasion and quick thinking often avert disaster when her irascible lifemate threatens to go on the warpath against the local humans. Though a passionate advocate for peace, she is as dangerous as a she-wolf when crossed and is not afraid to pull rank and put down dissenters when necessary. 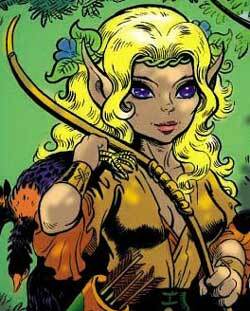 Joyleaf is as much the Wolfriders’ chieftess as Bearclaw is their chief, and is a maternal figure to all of her people. Together they gave birth to a son, Cutter, who embodies the best qualities of both his parents. Though Joyleaf met a grisly end at the fangs of the magically mutated creature Madcoil, she still offers support and guidance to her son in spirit form in times of great need. While her grandson Sunstream inherited her blonde locks, Joyleaf’s philosophical legacy is perhaps best manifested in her granddaughter Ember. While on the surface Ember seems closer to Bearclaw in mindset, she sees the long-term consequences of her actions just like her grandmother, and is willing to put her chieftainship on the line to break the millennia-old but fruitless and destructive human vs. elf vendetta.